Rename large number of files according to a specified renaming rules. 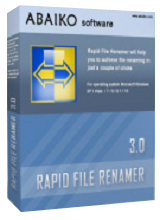 Rapid File Renamer 3.0 was available as a giveaway on July 9, 2016! Rapid File Renamer enables you to rename large number of files according to a specified renaming rules. You can add, remove or replace text in the file name, insert counters and dates, and also change the letter case. The program can independently process both filenames and their extensions. The new filenames can be previewed before they are applied, and you can then choose to replace the original files or create renamed copies in a new folder. 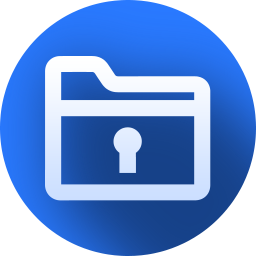 Other program features include: processing subfolders, renaming files based on how they are sorted, previewing new filenames and undoing changes. If you need to archive digital photos, collect music, or work as a webmaster, and have to process a lot of files, then this tool can be extremely useful for you. We apologize to the Chinese and Japanese users, the program may not work on Chinese and Japanese Windows. How would you improve Rapid File Renamer 3.0? see Windows or color themes added. Too bright. Use software Batch Rename Files Tool. You can easily found hier BatchRenameFiles.org. Flower 1234.jpg, Flower 1235.jpg etc. AcdSee has this ability - although few other file re-namers do. Although the installer shut down XYplorer aytomatically it then hung saying the program was still open. When I continued the install went OK.
My camera typically names files as NEW_1234.jpg, NEW_1235.jpg I want to rename to Flower 1234.jpg, Flower 1235.jpg etc. This program will not do that ie the counter will not keep the digits in the name from the camera and use those AcdSee has this ability - although few other file re-namers do. Although the installer shut down XYplorer aytomatically it then hung saying the program was still open. When I continued the install went OK.
Go to "Source filename options" and select the "Replace" tab. In the "Replace:" field type "NEW_". In the "With:" field type "Flower ". Now use the "Preview" button and if all ok you can start rename. Go to "Source filename options" and select the "Replace" tab. In the "Replace:" field type "NEW_". In the "With:" field type "Flower ". Now use the "Preview" button and if all ok you can start rename. I use InFanView (free) to bulk re-size, re-name & re-number images, and it works well and is fast. How is this better? Powder_Skier, read the description of today's offer. You figure it out. Thanks everyone for comments! Thanks GOTD! Will rapid file renamer rename Karaoke files like mp3+g files? mp3+g files consist of 2 files named the same except for the extension (.cdg and .mp3). I need it to be able to use the mp3 tag (contained in the mp3 file) to rename the file and rename the mp3 tag according to the file name? I also need to add a unique sequenced number to the file name such as 10000 or 20001 which is used to catalog and index the file in song books. Activated fine on Windows 10 64 bit and windows xp home 32 bit. Will rapid file renamer rename Karaoke files like mp3+g files? mp3+g files consist of 2 files named the same except for the extension (.cdg and .mp3). I need it to be able to use the mp3 tag (contained in the mp3 file) to rename the file and rename the mp3 tag according to the file name? I also need to add a unique sequenced number to the file name such as 10000 or 20001 which is used to catalog and index the file in song books. Activated fine on Windows 10 64 bit and windows xp home 32 bit. I have been using TagScanner ( http://www.xdlab.ru/en/index.htm ) to organize my rather large audio library, While I don't have any Karaoke files to test it on, I know that it **CAN** rename music files according to their tag info. It can also organize files based on tag info, moving them into folders either automatically, or based on rules you create. It might be worth your time to check it out. Harold, I have been using TagScanner ( http://www.xdlab.ru/en/index.htm ) to organize my rather large audio library, While I don't have any Karaoke files to test it on, I know that it **CAN** rename music files according to their tag info. It can also organize files based on tag info, moving them into folders either automatically, or based on rules you create. It might be worth your time to check it out. Harold, If this program does not do what you want, check out Mp3tag program. This will do what you want with the Convert / Tag - Filename command. Use a format strings like: $left(%artist%, 30) - $left(%album%, 30)\$left(%title%, 40). 1. You must unzip all files. Do not run files from zip archive. 2. Restart the program after activation. How to avoid problem with registration: 1. You must unzip all files. Do not run files from zip archive. 2. Restart the program after activation. This sounds very similar to Flash Renamer by R L Vision which I have used for years. I've been using Rename4u for years and it works well. Much smaller size. I just installed it on Win10 64x with no problems. It's free with donations encouraged. I've been using <a href="http://www.kellysoftware.com/software/rename4u.asp">Rename4u</a> for years and it works well. Much smaller size. I just installed it on Win10 64x with no problems. It's free with donations encouraged. 2 free apps that do this and more: • Advanced Renamer • Bulk Rename Utility Compare and see! Jerom, Agree. I've been using Bulk Rename Utility for years. It would be helpful to us if the software vendor would explain why we should switch to their product, in comparison to the 2 free apps you mentioned. You named probably the two best apps in this category. I've had them on my computer for years. Bulk Rename Utility for its context menu entry (e.g,, choose a bunch of files, right click, choose "Bulk Rename Here"), and Advanced Renamer because its portable and because it goes well beyond merely renaming files. It can also do file attributes/time stamp manipulation, and I've used it a number of times to change the "Date Taken" timestamp on photo files (sometimes the clock on your camera isn't set properly, and I hate having a bunch of photos with the wrong date). It does this through its integrated use of "ExifTool", which is very clever. I would suggest to anyone who doesn't have a lot of experience with apps in this category to go ahead and download the GOTD, and also the two programs that Jerom mentioned. Do a little head-to-head between the three apps and just keep the one you like best. Jerom, You named probably the two best apps in this category. I've had them on my computer for years. Bulk Rename Utility for its context menu entry (e.g,, choose a bunch of files, right click, choose "Bulk Rename Here"), and Advanced Renamer because its portable and because it goes well beyond merely renaming files. It can also do file attributes/time stamp manipulation, and I've used it a number of times to change the "Date Taken" timestamp on photo files (sometimes the clock on your camera isn't set properly, and I hate having a bunch of photos with the wrong date). It does this through its integrated use of "ExifTool", which is very clever. I would suggest to anyone who doesn't have a lot of experience with apps in this category to go ahead and download the GOTD, and also the two programs that Jerom mentioned. Do a little head-to-head between the three apps and just keep the one you like best. It doesn't appear to include the essential component for a bulk file renamer: integration in the Windows context menu. That is, when I select a number of files in Explorer, and right-click on them, the context menu which pops up should include "Rapid File Rename." sorry to say but today's offer is way inferior in handling to ReNsmer, which btw. is free for personal use. The matrix below highlights feature differences between "Lite" and "Pro" versions. Not mentioned at all on the website: does it include renaming by any meta tag information? mp3 and epub come immediately to mind. Lots of things can do Mp3.. I've never found one that can rename epub books based on the opf file. This is a looks to be a very simple renamer. Not worth bothering with thanks. Smooth, painless installation and registration. My computer is Win7 Pro x64. This program seems to do what it says quite easily! Thanks so much, GAOTD and Abaiko Software! If you are looking for a simple file rename utility this app works well. ran a few quick and simple test - handled them just fine. Bulk Name Utility can be a bit overwhelming at first but when you need it it has the power to handle those tough and complex tasks. If this app giveaway doesn't meet your needs be sure to check out BNU. This with today's download will make a pretty powerful combination. I've been using a FREE program for many many years and it is available at the following link:- http://the-rename.soft32.com/free-download/ This with today's download will make a pretty powerful combination. Have been testing today's download and compared it with the free program I mentioned, and quite frankly prefer the free program. Feel it is more versatile in the way you name files, also the image preview is done within the program. One other point regarding the program; donations go to a cancer fund as the writer's brother died at a young age from it. I much prefer this freeware over today's download. Have been testing today's download and compared it with the free program I mentioned, and quite frankly prefer the free program. Feel it is more versatile in the way you name files, also the image preview is done within the program. One other point regarding the program; donations go to a cancer fund as the writer's brother died at a young age from it. I much prefer this freeware over today's download. TheRename was my preferred tool before switching to BRU. A very nice and well done, indeed. Unfortunately development is halted. For XP users though, it is a must-have. For description and screenshot, the link is the-rename.soft32.com. Tata, TheRename was my preferred tool before switching to BRU. A very nice and well done, indeed. Unfortunately development is halted. For XP users though, it is a must-have. For description and screenshot, the link is the-rename.soft32.com. Thanks, I had never heard of BRU, just downloaded it now, it looks an absolute powerhouse of a rename program. The developers of today's programme will have to do a huge amount of work to be able to compete against either of these freeware programs. Thanks again, and great to see you back. papin, Thanks, I had never heard of BRU, just downloaded it now, it looks an absolute powerhouse of a rename program. The developers of today's programme will have to do a huge amount of work to be able to compete against either of these freeware programs. Thanks again, and great to see you back.